FC Barcelona will miss their inspirational captain Carles Puyol, for ten days. Puyol was substituted midway through the match and his absence resulted in Barca conceding two unnecessary goals. Test done on Puyol showed that he has suffered a "small muscle tear to the back of left thigh". The injury to Puyol will mean that Pique is going to get more playing time; but how much we are going to miss him on the pitch is yet to be seen. Marquez and Pique could form a very good partnership in the absence of Puyol. Puyol now is certain to miss the Racing Santander match, the first leg of Copa Del Rey semifinal against Mallorca and may even miss the Sporting Gijon match. Most probably Guardiola would have rested him against Mallorca and Gijon so this could not be bad. Ok now some news from the transfer market. All the stupid speculation of Messi moving out of Barcelona has been sidelined after Messi made it clear that "Unless he is kicked out from here, he ain't going anywhere". Gudjohnsen and Toure also have put rest to rumours relating to them. So with Guardiola not interested in going for a winter signing all the focus now shifts to whom we are going to sign in the summer. Frank Ribery and Lahm does feature at the top of the list. Ribery could be a healthy addition as he is a natural winger. Lahm is seen as a cover for aging Sylvinho but is yet to be seen whether Guardiola will go for him with Abidal playing to his potential now. FC Barcelona kept their dream of an unprecedented treble well alive with a 3-2 victory against Espanyol, not before being scared out of their skin by a resurgent Espanyol side. FC Barcelona put themselves in the spot of trouble with reckless defending and time wasting which affected their tempo. 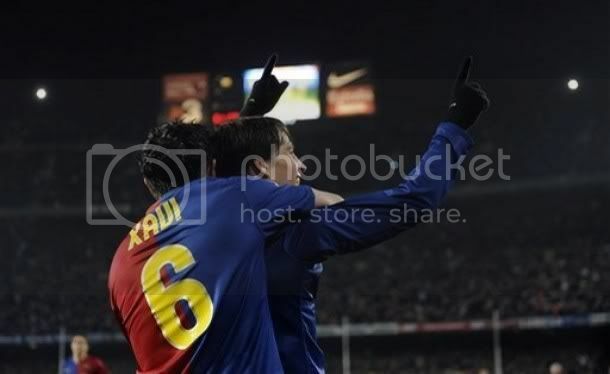 Bojan struk in either half and Pique added the the third to give Barca a comfortable three goal lead. But Espantol always play tough against their City rivals, and they pulled two goals back through Coro and Callejon. Now FC Barcelona faces Mallorca in the semi finals. The first leg of the same will be held next week at the Camp Nou and the return leg will be on 4th of March. Guardiola chose to field a very strong side; the side may have missed the likes of Eto, Iniesta and Henry in the starting eleven but stil was a very competitive side. Pinto did took over from Valdes in the goal. Alves, Puyol, Pique and Sylvinho formed the defense. 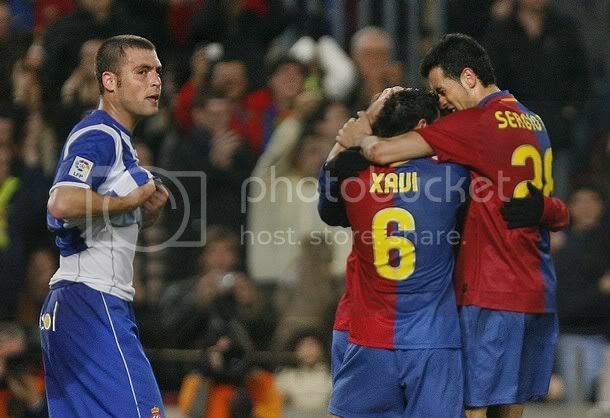 Busquets played the holding midfielder role and along with Xavi and Gudjohnsen formed the midfield. Messi, Bojan and Hleb formed the front troika. FC Barcelona started the game well but a determined Espanyol defense held them back. The first real chance came in the 18th minute when Gudjohnsen headed the ball into the net from a Xavi delivery; but he was ruled offside. Xavi had the next best oppurtunity in the 27th minute withn another header from an Alves cross, but Espanyol keeper pulled out a good save. But in the 35th minute the Espanyol goal keeper was at the receiv ing end when Bojan tapped the ball in to goal after Cristian fumbled a seemingly harmless shot from Sylvinho. Just before the break Barca should have gone two nil ahead with another Gudjohnsen header from a Xavi delivery; but this time again Cristian pulled out a much better save. 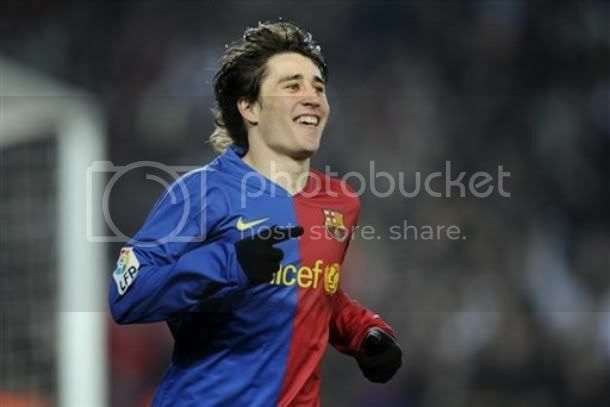 After the restart Bojan put FC barcelona 2-0 up with an excellent finish. Xavi played a lovely ball to Bojan on the left side of the box, Bojan chipped the ball past an advancing goal keeper to show his talent. Then in the 56th minute Pique added one more with a header from an Alves cross to take FC Barcelona 3-0 up. After that we relaxed a bit and that resulted in Espanyol scoring twice. The first goal had a bit of luck associated with it, Coro's shot took an unfortunate deflection of Busquets and landed in the goal. But the second from Callejon was due to the mistakle from Pinto, he looked like covered Callejon's powerful shot but somehow let it go through his hand. Iniesta and Eto was brought in, Iniesta made sure that Barca finished off the game without much of a scare. Pinto's performance in the match was a bit off colour. The biggest dissappointment would be Hleb who wasted another chance to cement his place. 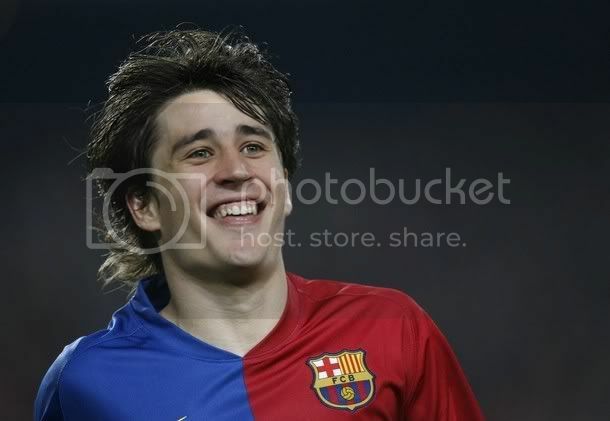 Bojan looked getting back to normal, the second goal would have done him a world of good. Busquets was majestic throughout the match and I feel the Defensive midfielder role is the best covered position in Barca at this moment with Toure and Busquets matching each other. FC Barcelona could be up for their most toughest test of this seaon when they take on Espanyol at the Camp Nou tonight. Espanyol is fighting a relegation battle and should not worry FC Barcelona in normal circumstances. Then a knock-out match is no normal circumstances. Till this day whenever FC Barcelona went to play we had the assurance of having another match to correct the performance, if something goes wrong. But not with tonight's match. With virtually no gains from the first leg at Espanyol FC Barcelona has to see off a spirited Espanyol side, who looks very well organised under their new coach. Guardiola would have to field a very strong side for today's match. Some section of FC Barcelona fans may disagree with that. In their opinion Copa Del Rey does not generate any interest and FC Barcelona should avoid the temptation to field big players in the game. But I have to differ witrh them; may be it is the most non-glamorous of all the trophies which we are chasing this season, but still the sheer fact that we haven't won this competition for some time should have made us more eager to land this trophy. As usual Guardiola has not yet announced the squad. Keita and Marquez are carrying knocks but are declared fit to play tonight. Pinto should take over from Valdes at the goal. Alves, Puyol, Pique and Sylvinho would ideally make up the back four. The midfiedl should be made up of Xavi, Busquets and Gudjohnsen. Iniesta and Bojan should join Messi to form the front trio. FC Barcelona would be favourite to win this leg; but this would be that kind of match where both the team have equal chances. FC Barcelona needs to take control of the game early and finish off the game early, that's why I would go with a strong starting eleven. FC Barcelona needs to win this match to go through, whereas Espanyol needs only a goal scoring draw. I predict a Barca victory by a margin of 3-0. When Thierry Henry arrived in Barcelona, everyone was of the opinion that he was a year late. He was supposed to make the switch from Arsenal to FC Barcelona a year earlier, but it took he deferred the decision after the bitter loss at the hand of FC Barcelona in the Champions League final. So many including myself have disagreed on his signing; I personally believed and still believe that his signing at that time did more to increase the unrest in the dressing room rather than the harmony. Eto was supposed to struggle to hold on to his position after the French international's arrival. But soon after his arrival the fairytale bubble started to burst. He did struggle to hold on to his position; this coupled with Ronaldinho's troubled season means FC Barcelona went off the title chase from the beginning. May be it is not fair to say that he struggled; after all he scored 19 goals from 47 appearances in the season. Add to it 11 assists that is really an impressive tally for any player except Thierry Henry. Thierry Henry's exploit with Arsenal made sure that the expectation remained sky high when he arrived at FC Barcelona. And you cannot deny the fact that he struggled especially in terms of making his presence felt in the team. But then this season has been a complete revelation. He along with the other two of the fantastic trio has scored seventy percent of goals of this season. Thierry Henry has already have 14 goals from 24 appearances so far this season. What made this turn around possible? Many argue that he took one year to come to terms with the style of play in La Liga and especially FC Barcelona. He had a turbulent last one year in terms of personal affairs and since it is settled for good, many argue we are able to see a changed Henry. But is it all? I think there is more to this change and it should be more of a mental change. The start of the season it was clear that Guardiola would prefer Henry over Eto anytime, but still Henry lost his place to another budding superstar Andres Iniesta. It is not a shame to have lost the position to Iniesta, who according to me is the second most talented player we have got. Henry did voice his displeasure in the begining but slowly came to terms with reality of the situation. For me he has convinced himself that he may not reach back to his glory days, and that resulted in a sea change in his attitude. He started contributing so much for his team mates. He no longer complaints that he is played out of position in FC Barcelona, instead he made the left flank his own. And it is no surprise that many of our moves now comes from the left flank where a 31 year old Henry is running like hell. And it is no surprise that he has contributed more to his team mates performances than during his times in Arsenal. At 31 Thierry Henry will never reach back his peak, and that realisation by the French Man could prolong his career for long. He could do a Ryan Giggs for sure if he keep on adjusting to the realities of his age and time. At this moment he lies joint fourth in the Pichichi list along with Higuain and Forlan. He is the most oldest player in the top five of that list at this moment. Usually a visit by a small club may not generate too much interest at Nou Camp. Then Numancia is no other minnow club; they are the only club to have beaten FC Barcelona this season in the league. FC Barcelona's defeat at Numancia might have been forgotten by the footballing fraternity but not by the fans. That 1-0 defeat shook us all but more importantly Guardiola; and he has been correcting that brilliantly all these times. Naturally there is cries from the fans to get the records straight but Guardiola true to his nature has under played all those silly cries. He has once again reminded everyone that Numancia would not be any push-over and he expects Barca to battle till the 90th minute to take the game. Numancia lies in the 17th position at present and that do worry me. Throughout this season we have struggled against sides which lies in the bottom of the table. Numancia's away form this season hasbeen horrifying; they have lost every game except the Espanyol visit. Numancia is expected to go with a defensive approach and would most probably feature a five man defense. Guardiola has not yet announced the side. Valdes would return back to the goal. Marquez is injured hence Pique would partner Puyol in the centre of defense; Abidal and Alves is expected to retain their position of full backs. This could be the match where we would yet again get a glimpse of the tremendous midfield we have compared to all over Europe. I expect Iniesta and Xavi to partner Toure. Messi, Henry and Eto should form the front troika. Thsi one could be another tough match, but we can expect the team to be up for it. After a dissappointing showing in Espanyol, the team would be looking to set the records straight. I expect Fc Barcelona to win the game comfortably with a score line of 5-0. Once again FC Barcelona struggled at the Olympic Stadium in Montjuic. FC Barcelona were held for a goal less draw by Espanyol in the first leg of Copa Del Rey Quarter Final. Guardiola earlier have suggested that he would field the best available side but he dissappointed so does the team. Guardiola brought in nine changes to the team which started last week against Deportivo. As expected Pinto took charge of the Goal. Puyol replaced Alves as right back, Caceres and Marquez held the cenral defense and Sylvinho replaced Abidal as Left Back. 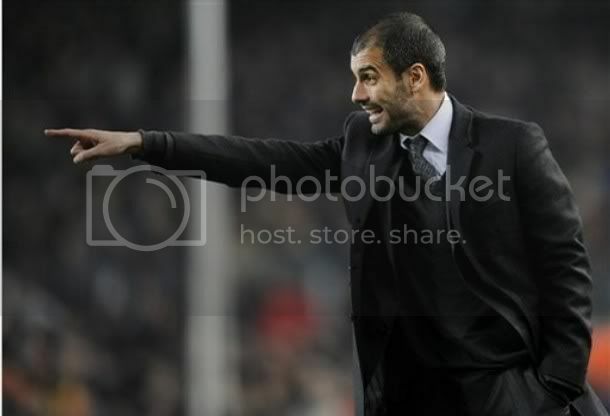 Guardiola opted for a defensive minded midfield with Gudjonsen, Keita and Busquets partnering in the middle. Hleb, Bojan and Iniesta formed the front trio. In my opinion Guardiola made the big mistake of not slotting Iniesta in the middle. With the absence of Xavi, placing Iniesta in the front effectively cut off any service from the middle to the front. Espanyol inspired their new coach Mauricio Pochettino and the home fans did have the better of the first half. Actually FC Barcelona effectively had no attack against Espanyol in the first half. 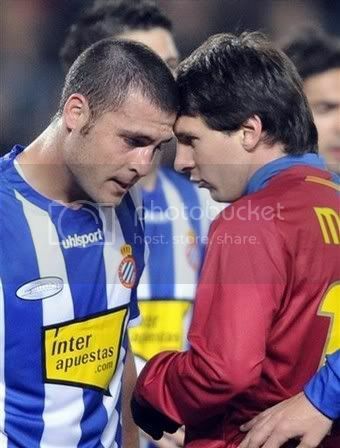 On the contrary Pinto was called in more than one occasion to avert the danger. Andres Iniesta was the only player who had a goal on target when he shot staright at Kameni. BUt the best chance of the first half fell to Luis Garcia but Pinto did get enough touch on the ball to take it wide off the goal. The second half also saw the game being played in the same tempo. FC Barcelona looked a bit more settled in defense and that resulted in Pinto not getting troubled much. 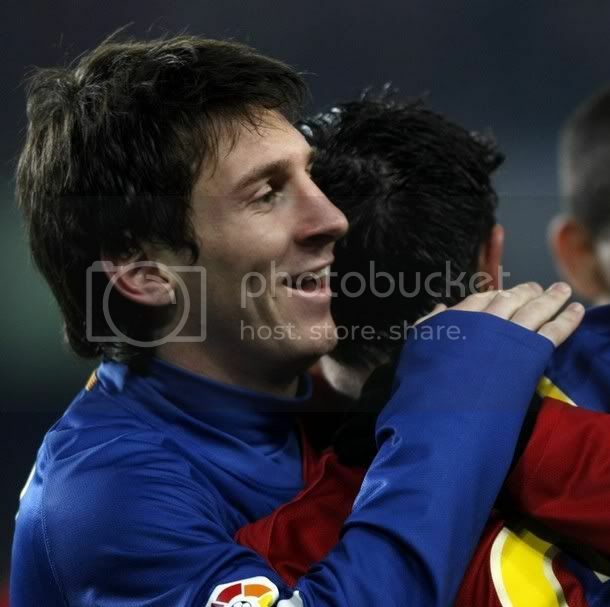 The addition of Xavi and Messi towards the end also did nothing interms of the match. FC Barcelona was giving away possession too cheaply throughout the match. A draw away from home is a good result. But now this result makes the return leg somewhat like a real knock-out match. Espanyol only needs a goal scoring draw to proceed to the next stage. Now Guardiola has to field his best side in the second leg. Bojan tried too hard to impress but was effectively shut down by the defense. Iniesta was not getting any service and should have switched his position with Gudjohnsen. Hleb was too wasteful and it is sad to see these guys not trying their best to compete for the position in starting eleven. Then it is difficult for the team to gel together when there are changes in whole position. That is the only reason why I feel Gudjohnsen and Hleb struggle when they are slotted in team like yesterdays' and seem to do well when slotten in the regular line-up. FC Barcelona would be hoping to produce another sensational performance against Espanyol tonight at the Olympic Stadium on Montjuic. FC Barcelona's last visit to Espanyol resulted in a very controversial win for Barca - A Messy Win. That was the night when the infamous Boix Nois once again came into the fore front. The group has yet again has announced that they will get into the stadium. Espanyol authorities need to take more tough measures to make sure that no unwanted incidents take place. Espanyol is in dire straits as far as league is considered. They have sacked their coach Mane after Sunday's 4-0 defeat at the hands of Malaga. 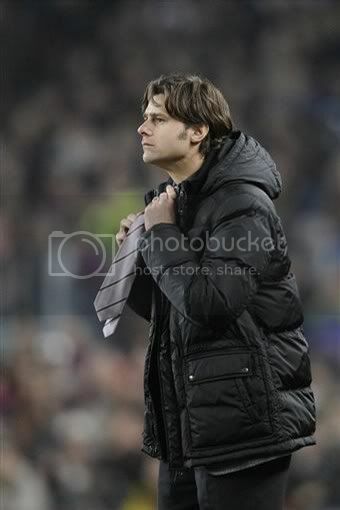 Mauricio Pochettino has been named the new coach. That woories me, as always with the arrival of a new coach there will be new belief among the players and that could lead to an excellent display. BUt still it will be too much for Espanyol to overcome this rampant FC Barcelona side. Eventhough we struggled against Espanyol last time; this FC Barcelona side has improved in leaps and bounds after that visit. Raul Tamudo, a terror for Barca will not be available for Espanyol in tonight's match due to injury. All is not supposed to be well at Barca. 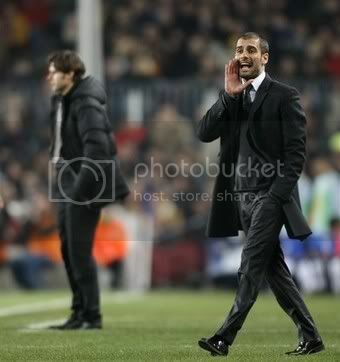 Eto and Guardiola reportedly had a verbal confrontation during training. MundoDeportivo reports that Guardiola was not too happy with Eto's efforts on the training ground and asked Eto to hit the showers early; Eto didn't take that lightly and entered into an argument with his boss. It is not clear whether the two has made up since, but one thing is clear that Guardiola would not allow any of his players to be complacent and that is so good. Guardiola has not yet announced his squad, but he has indicated that he would be unleashing a very strong side. Pinto would be at the Goal in place of Valdes. Sylvinho, Puyol, Marquez and Alves would be forming the defense. Iniesta, Xavi and Busquets would be expected to form the midfield. But their may be a chance of Xavi being rested and then Keita would take his place. Hleb, Bojan and Messi is expected to form the front trio. There are reports suggesting that Pochettino would be using a 4-3-3 style, this could be dangerous for Espanyol as FC Barcelona players would have so much space to work with. I predict a Barca victory with a scoreline of 2-5. Today there are reports emerging about Manchester City calling off the Kaka Transfer deal. Had this deal gone through it would have put all other record transfer deal to shame. But I am not writing about this deal; niether I am interested in any of them. Usually I don't write anything apart from news related to FC Barcelona, but thsi time I am yet again tempted to. While surfing net I came across the news of Luka Podolski's expected transfer to FC Koln(Cologne) in the summer. Many may call this transfer as a suicidal move interms of Podolski's career is concerned. He along with Bastian Schweinsteiger and Philip Lahm are the most talented youngsters in German National Football. Hence it is more of a surprise that he decided to go back to FC Koln from a bigger club like Bayern Munich. Money may not be the only thing he may be missing at Cologne but also a chance to play European football. For once a footballer has chosen to follow his heart rather than his brain. Luka Podolski made his Budesliga with FC Koln in 2003-04 season. But FC Koln was relegated to second division. Eventhough Podolski's talent was noticed, he decided to stay with FC Koln and got them promoted in the 2004-05 season. With a magnificient performance of scoring 24 goals he took his club back to the top-tier. Podolski remained an integral part of German national side all through this. But when FC Koln was relegated again Lukas Podolski moved to Bayern Munich for a sum of 10 million Euros. It is now reported that he is making a move back to FC Koln for the same amount. Critics may argue that Podolski never got a regular team place in Bayern Munich and anyway was looking to move to another club. But Bayern and Podolski should be appreciated to see the passion in the move rather than the economic viability. Bayern could have sold him to any of the top clubs in Europe. But still it is commendable from Bayern's part to have allowed the player to follow his heart. One thing is for sure, the people of Cologne loves their Prince like hell. Podolski inspired Bayern to a 3-0 victory at FC Koln; the Cologne fans cheered Podolski's goal against their team (may be the first time in history) to the complete astonishment of Cologne players and Bayern coach. Valdes - 6 - Nothing to do throughout the match. Alves - 9 - The best Barca player on the pitch. Totally dominated the right wing. Set up two goals and created two excellent cross which Messi headed wide. You cannot ask more from him. Pique - 7 - Lack of action was his only problem. But cleared the line whenver called upon even it was too few. Puyol - 8 - Another Captain's performance. Solid in the back and created the last goal with excellent vision in the box. Abidal - 7.5 - Have completely silenced his critics with a no non-sense performance from December. A usual composed and contained performance. Send in some delightful through ball. Xavi - 8.5 - Another great performance by the midfield general. No doubt why Ferguson is interested in him. Great vision, passing and unselfish play by xavi Hernandez. Toure - 7.5 - Was overshadowed by his team mates but his performance was solid. he formed the rock on which Barca could builf their attack. Keita - 8 - He looked like a total misfit as an attacking midfield in earlier matches, but not in this one. he was involved in 80% of Barca move. one thing I like about him is his eagerness to get into the box. Great performance. Messi - 7.5 - As usual great performance. Could have elevated a bit but then when his team mates are playing like this he even can take some well deserved rest. His partnership with Alves was great but wasted two excellent cross form the latter. Eto - 7.5 - Another solid performance. Leading the league scorers sheet at the moment. Henry - 8 - The best of the front three. He was involved in all attack. Iniesta - 8.5 - Got only few minutes to impress. Did his job to perfection. What else you can say about a player who had a shot at goal and created two goals in allowed twenty minutes. FC Barcelona broke the record for most points by a La Liga outfit in the first half os any season by a commanding demolition of Deportivo La Coruna at the Camp Nou. With the 5-0 destruction of Deportivo Fc Barcelona has amassed 50 points by the half stage of league. Three of FC barcelona's front men all got into the score sheet with Henry and Eto scoring twice and Messi opening the scoring. It is an astonishing record with Barca winning 16 games, drawing twice and losing once to Numancia in the first match of the League. FC Barcelona against Deportivo fired at all cylinders and it's good to see the team hit their top form especially with many important Cup matches coming in future. Guardiola decided to start Iniesta from the bench in the match. Valdes was back at goal; Alves, Pique, Puyol and Abidal formed the defense. Keita and Toure joined Xavi in the middle. The front three was the usual Henry, Eto and Messi trio. FC Barcelona started dominating from the word go. In the first minute Henry's shot was saved by Deportivo goal keeper Aranzubia with his legs. In the next minute Aranzubia denied Henry again by parrying away a powerful Henry shot. In the 21st minute Xavi passed the ball to Messi on the right after Deportivo player Rodriguez gifted the ball to Xavi; Messi sets on with his diagonal run and shot back at the Goal from the edge of the box; the ball beat Aranzubia and squeezed in off the far post. In the 27th minute Henry doubled Barca's lead with a great header from an excellent Alves cross. In the 34th minute Messi wasted an open chance to go three goals ahead, when he headed wide another excellent Alves cross with only the Goal Keeper to beat. In the 36th minute Abidal played Keita on with a superb long through ball, but Keita's shot was deflected for a corner. In the 41st minute Eto got into the score sheet with an easy tap in after the initial Keita header from an Alves cross was saved by Aranzubia. Second half started with FC Barcelona shifting a couple of gear down. There was no urgency shown, but that was understandable. In the 52nd minute Messi great shot was saved by Goal Keeper; Messi skipped past two defenders after receiving the ball from Henry. In the 71st minute Guardiola brought in Iniesta for Toure. There was chanting of Iniesta's name all around the stadium before he was brought in. In the next minute after his introduction Iniesta showed why he was loved by the Camp Nou faithfuls. Iniesta's excellent side-footed volley was saved by Aranzubia from a Henry cross. In the 75th minute Alves saw his free kick dipping just high of the post. In the 77th minute Messi wastes another excellent cross from Alves with a wide header similar to the first half. In the 82nd minute Hnery made it 4-0 with an easy tap in. Iniesta great vision and pass found an excellent Xavi run on the left; Xavi unselfishly cuts the ball back to Henry to score. In the 84th minute Aranzubia was sent off for bringing down Puyol after Iniesta has played him through. The move was started by Puyol in his own half, he continued his run and was picked up by Iniesta with an excellent pass. Eto scored from the resulting penalty to go 5-0 up. This one was another great win for Barca, probably the best after the winter break. There were some exceptional performance mostly Henry, Keita, Xavi and Messi. But one guy whose performance gave me so much joy was Iniesta. There was two reason for it - number one is that he was back to his best; he wasn't up to his best in previous matches and his coming back to form is the best thing for Barca as I believe he is the most talented and important player in the squad after Messi. Second this performance came in the midfield, that means Henry need not worry much about his position and soon Barca will have a midfield featuring Toure, Iniesta and Xavi regularly.